On April 11, the Butler Women's Club Volleyball team won the national championship by defeating the University of Wisconsin-La Crosse. "I think our energy throughout the whole day helped us get through," said Kerry Risley, the club president. "I know we were all exhausted, but our adrenaline and keeping each other pumped up got us through those last games to get the win." The women's volleyball team is one of 16 Butler club sports teams. Club sports give hundreds of dedicated Butler students an outlet to have some fun and still make time for sports. Here's a look at three of the club teams. “I think we could really do this,” Michele Di Fatta, vice president of Butler Women’s Club Volleyball, said from across the hotel room. “I think so, too,” Kerry Risley, club president, replied. The volleyball team just crushed the first day of competition in April at the National Collegiate Volleyball Federation national championship in Kansas City. Winning all three games “pretty handily,” Risley could tell her team was on point and playing to its full potential. The team worked all year to perfect its game at bi-weekly practices and tournaments across the Midwest. Risley recalled the team’s excitement and pride winning gold on home turf at the Bulldog Winter Classic in late January. A student-run club team, members range from freshmen to seniors with majors just as diverse. A jumble of conflicting schedules and commitments, Risley said it is often difficult to achieve perfect attendance at practices. But the national championship gave the team a boost of motivation. It’s been a longtime club goal to compete in the large tournament, and Risley said she was impressed by the vigor and enthusiasm of club members to go for gold. The tournament win marked the end of the club’s season, but Risley is already gearing up for next year. Re-elected as president for a second term, she said she plans to sign up the team for the 2016 national championship. “I don’t think it’s crazy to say we want to shoot to win it again,” Risley said. After playing high school basketball, Nick Donati ’16 decided he would devote his time in college to his studies. Then the Wheaton, Illinois, native went to Block Party—Butler’s pre-semester event where students learn about campus organizations—and heard about club basketball. Donati made the club team as a freshman and has been active ever since. He’s now the Men’s Club Basketball President. “It’s making my college experience so much better,” he said. Men’s basketball is one of 16 club teams that Butler fields, giving students who might not have the skills to play Division I sports the opportunity to get out and play competitively against other colleges. (The team’s Twitter is @bumensclubbball.) The Student Government Association funds the teams. 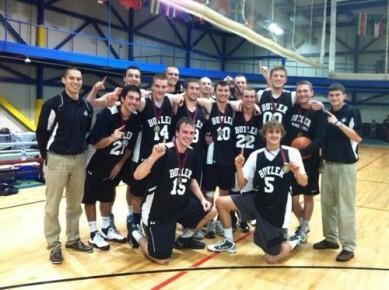 Butler’s “other” men’s basketball team, which has been around for five years, plays 20-30 games from September to April. They start with exhibition games (mostly against Indiana teams, including Ivy Tech and Indiana University) and host their own fall tournament at the Health & Recreation Complex. During the spring semester, they play in a regional tournament and, if they win, they go to the national tournament in North Carolina. Two years ago, they finished second in the national competition, which is overseen by the National Intramural-Recreational Sports Association. This year, they lost in the regionals in Dayton. Donati said it can be “a little weird” to play basketball at Butler when you’re not on the team that plays in the Big East and you play in front of tens of people rather than thousands. Still, there is the possibility of crossover. Trey Pettus, who started with the club team, became a walk-on on the men’s basketball team. Andrew Koelper ’17 had a difficult decision to make: school or tennis. 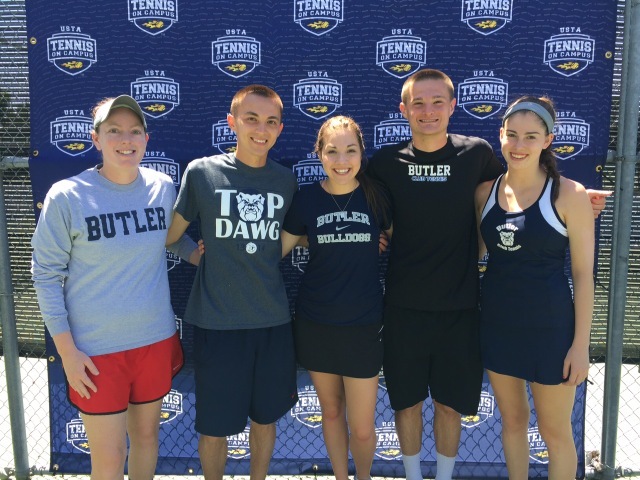 Butler Club Tennis was headed to the United States Tennis Association (USTA) Spring Invitational in Tucson, Arizona, the first national championship the club would compete in. But Koelper, club president, had an organic chemistry test on Monday morning. 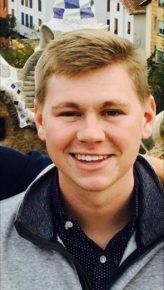 His decision exemplifies one of the great things about club sports: They are flexible extracurricular activities for competitive athletes and dedicated students. This year, Butler’s tennis club had about 40 active members who regularly came to bi-weekly practices to hit around, improve their technique, and just have fun. There are no tryouts—all with a tennis racket are welcome. Club Tennis is part of the USTA Tennis On Campus, a nationwide league of collegiate club tennis teams. The program coordinates competitive opportunities for students not involved in a university athletic program. 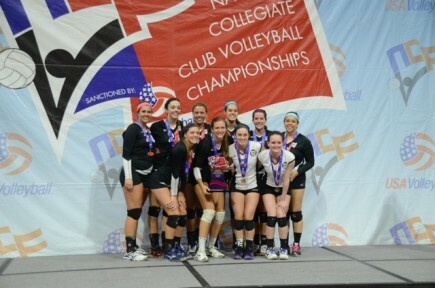 About 10 club members competed throughout the season in tournaments ranging in size from the large 48-team national championship to daylong quad matches. Koelper said it was a good year for the club’s travelling competitors—they took home 20 of the 30 matches played. And with organic chemistry out of the way, he cannot wait for next year. Ellen DeGeneres surprised her friends at Butler University’s Delta Gamma sorority—again. But the fun didn’t end with a free vacation and the chance to breathe the same air as DeGeneres on the set of her show. DeGeneres invited the women to the stage to compete in the Delta Gamma Gameathon, a competition featuring root beer pong and flip cup, dizzy bat, and a tricycle race. 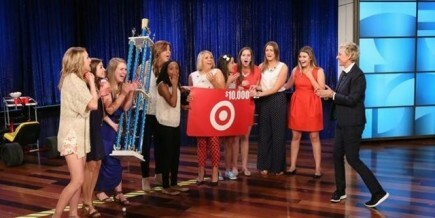 After the second tricycle crossed the finish line, DeGeneres presented the women with a 6-foot trophy—and a $10,000 gift card from Target. But again, DeGeneres had one more trick up her sleeve. She invited the women to return to her set next winter to appear on the “12 Days of Giveaways” episode. Von Helms, who had long dreamt of meeting DeGeneres, she said she still is amazed by the generosity and opportunity the talk-show host provided the women of Delta Gamma. During their January 8 appearance on the show, DeGeneres awarded the sorority a passel of prizes from her “12 Days of Giveaways.” The women donated some of those prizes to local homeless shelters, animal shelters, and to their philanthropy, Service for Sight, at the Indiana School for the Blind & Visually Impaired. They haven’t decided what to do with the $10,000 Target gift card.